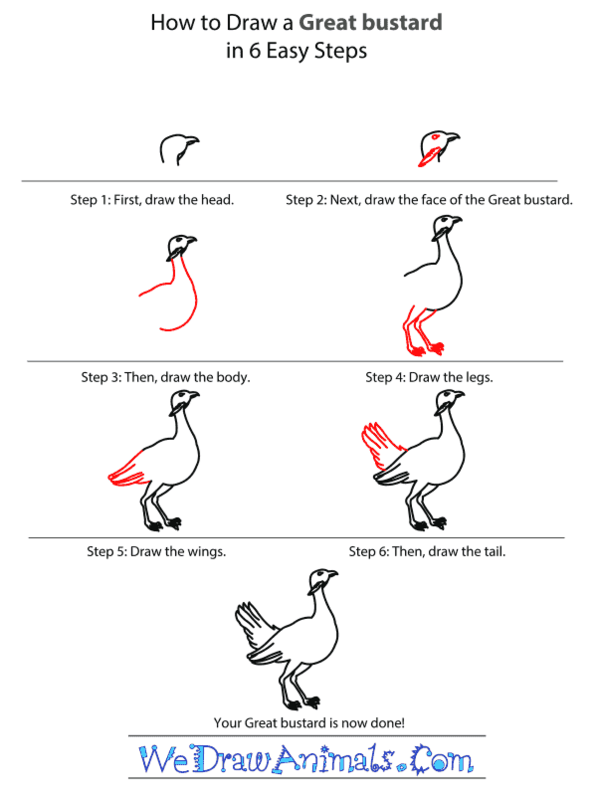 In this quick tutorial you'll learn how to draw a Great Bustard in 6 easy steps - great for kids and novice artists. 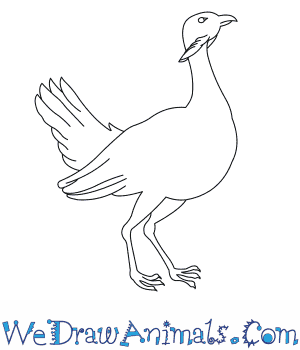 At the bottom you can read some interesting facts about the Great Bustard. 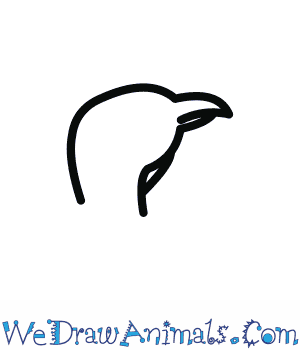 Step 1: Draw an open oval for the head that comes to a point for the beak. Step 3: Extend the neck into the body. 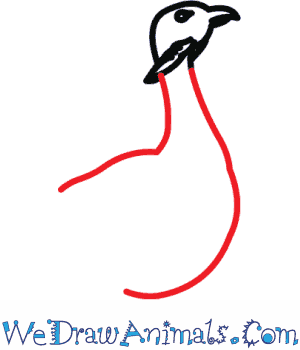 The neck is thin but long, and extends into a much bigger body. 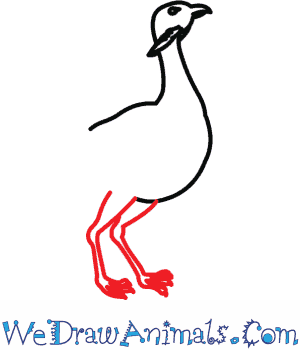 Step 4: Add legs to the bustard. 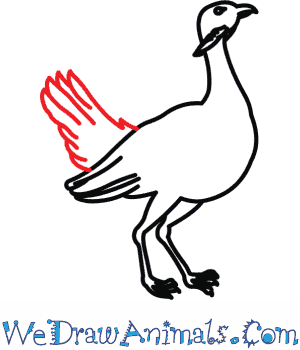 Remember birds' legs are very thin and bendy, and make sure to add talons at the end. 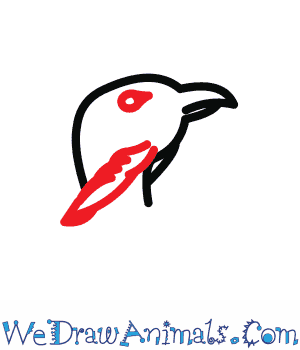 Step 6: Draw the tail, again using lines to make feathers. The only member of the genus Otis the Great Bustard is found in Southern and Central Europe and across temperate areas of Asia. They are the heaviest flying animal on the planet and has the largest difference between the size males and females of any bird species. 60% of the current Great Bustard population now lives in Spain. Male Great Bustards can weigh up to 40lb (18kg) and stand up to 3ft (105cm) tall while females are considerably lighter and shorter. Great Bustards prefer to run instead of fly when their disturbed, able to outrun red foxes that can reach speeds of 30mph (48kmh). Great Bustards regularly avoid human contact and groups can be split up by farming. Male Great Bustards put on a display during breeding season where their feathers are flared and their heads are buried. 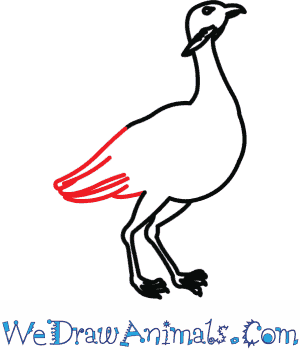 Lesson plan note: Because the Great Bustard has such big wings this activity will show kids just how big these wings really are. Take 6 sheets of A2 paper and put them longwise end to end across the floor. Tape these pieces together and have the kids decorate them to look like wings.